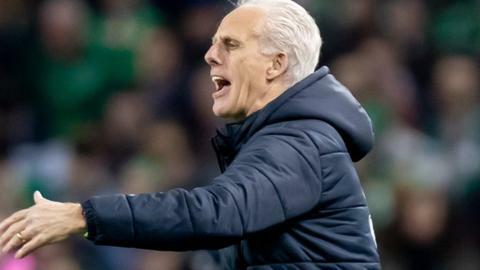 Republic of Ireland boss Mick McCarthy was delighted the tennis ball protest during their Euro qualifier win over Georgia didn't distract his players. A first-half Conor Hourihane free-kick gave the Republic a 1-0 victory in Dublin and sent them top of Group of D.
The goal followed a break in play as home fans threw tennis balls on to the pitch in protest at John Delaney remaining in the FAI hierarchy. "The incident didn't affect us," McCarthy told Sky Sports. "When something like that happens, you have to really concentrate and I was conscious that we didn't take the free-kick and get done on the break because we'd had to stop. "It maybe had an adverse effect on them because we scored when the tennis balls came on, but it didn't matter what had happened, it wasn't stopping that free-kick." Asked if he was concerned about any potential punishment from Uefa following the fans' actions, the former Wolves and Sunderland manager added: "I haven't given it a second thought." The protect against Delaney came after he stood down as the FAI's chief executive last week, only for the governing body to create a new position of executive vice-president for him. Tuesday's result ensured a 100% start to the Euro 2020 qualification campaign for the Republic after they had laboured to an away win by the same scoreline over Gibraltar on Saturday. McCarthy had said immediately after the match that he "hated every minute" of the game, but he was much more encouraged by his side's performance at the Aviva Stadium on what was his first home match of his second spell in charge of the team. "You understand why I said that - it was because of the nature of the game as we had everything to lose and nothing to gain," he continued. "But that horrible, scrappy, 1-0 win gave us the momentum we needed and we have had a 1-0 win tonight of a different ilk as we have played really well. "We could have put two or three past them. Admittedly, Georgia have had chances, but they are a good side. "Our all-round performance pleased me as we negated what they were trying to do for most of the game. The lads have put in an unbelievable shift. "We played some great football and created chances which we unfortunately didn't take, but we didn't let them in so one wins it." The Republic top the group after Switzerland threw away a three-goal lead to be held to a 3-3 draw by Denmark in Basel. McCarthy led the applause for lone striker David McGoldrick when he was substituted, and was also full of praise for goalscorer Hourihane. "I wasn't surprised at all with how well Conor struck his free-kick as he has a wand of a left foot," he added. "His free-kicks on Saturday were excellent also. I've always admired him and tried to sign him a few times. "David produced an outstanding performance up front on his own. He led the line, held the ball up and he deserved his man-of-the-match award."